Wow. It seems pretty crazy to be typing “week 30” already. This year seems to have gone by too fast and not fast enough at the same time. Just today I was thinking about how much of summer is already gone. Have to make the most out of the warm weather before it’s gone! Anyways, back to the topic at hand….unfortunately. Self Portraits. That’s what I am tasked with, and I’m not trilled about it. To say that the self portrait is the least favorite subject I could depict, weather it be photography, painting, drawing, or any other medium, would be an understatement. I cringed when we were instructed that self portraits would be our first project in my digital photo class. We all grumbled as we repeatedly worked on self portraits in preparation for our final in my drawing class. I about hit my head on the desk when we were instructed to completed yet another self portrait project in design. I truly despise them. Yet, as ironically as it may seem, I feel like you all have been privy to quite a few of them. Though some images may be abstract, you’ve seen version of my self portraits in week 24, week 6, week 19, and even in week 18. I suppose when necessary I will utilize the self portrait to convey my message. Something about that makes it much more enticing than being instructed to complete a picture of myself for a project. So I haven’t at all decided what I’m planning for this week. Part of me wants to simply complete the project as many would interpret it and take some pictures of myself. I never do, and this would be a good way to break that barrier. The other part of me wants to keep with the theme of just portions of myself; hands, eyes, feet, profiles, etc. Yet another part wants to take this in a completely new or abstracted way, photographing myself in a way I never have before, or simply photographing items which would capture the essence of me. I suppose you’ll see when I figure things out. In the meanwhile, I’ll leave you with one of the afore-mentioned school projects. In the design class I took, all of our projects, with the exception of the final, were completed in black and white. While the majority of our work was done with paint, pen, and pencil, we were lucky enough to have the option of any medium while completing the self portrait project. Since my teacher was already aware that I was a photographer, we both knew that was going to be my go-to. The objective was to use different values of light and dark to show two different sides of yourself, or two different personality traits. In the end, this turned out to be one of my more favorite projects. Once the images I selected were reworked into black and white, I loved the final result, and how the light worked in both images. Perhaps I’ll have to keep these positive results in mind while working on this weeks project. Enjoy. Last night I decided to bite the bullet, and get to work. About a month ago, I received a somewhat unusual looking envelope from MICA, amongst their very regular communications, which I have to say, I do appreciate. “Odyssey”, it was labeled, with its bright colors and excitement. Some transfer student information was enclosed. I slightly shrugged it off, and almost didn’t open it; I’ve been somewhat reluctant to look at all the wonderful things this school offers while being so unsure of if I’ll be able to attend. You know, don’t want to get my hopes entirely up — I’m a planner, and this plan isn’t coming together. Regardless, I’m also a curious one, so of course, I was bound to open the letter within seconds. “Call for entries — 2015 MICA Postcard Project”. Really? I haven’t even enrolled in classes, and we’re already being given projects. Of course it’s optional, but all very surprising at frist glance. In the letter was a set of instructions, a fancy little magnet adorned in the same exciting colors as the envelope, and a blank postcard. Subconsciously, I’ve already decided I was going to do this project. I mean, you just handed me a blank piece of paper with a stamp on it — I’m easily intrigued. In reading on, the project consists of decorating the postcard however we choose, and selecting from one of four topics: spirit animal, Dadaists collage (it’s just a urinal!! ugh, hate it! ), meme yourselfie (I’m questioning my age amongst these incoming students), and vacation postcard. Yes! Vacation! Love it! So even in my doubt, I start thinking of ideas. It’s a good thing when my mind starts racing creatively. I’m pretty set on the type of media, cyanotype, and am just working out what my subject will be. When I think of vacation, nothing else, or better, comes to mind than the beach. “But how will this translate to cyanotype”, I think to myself. 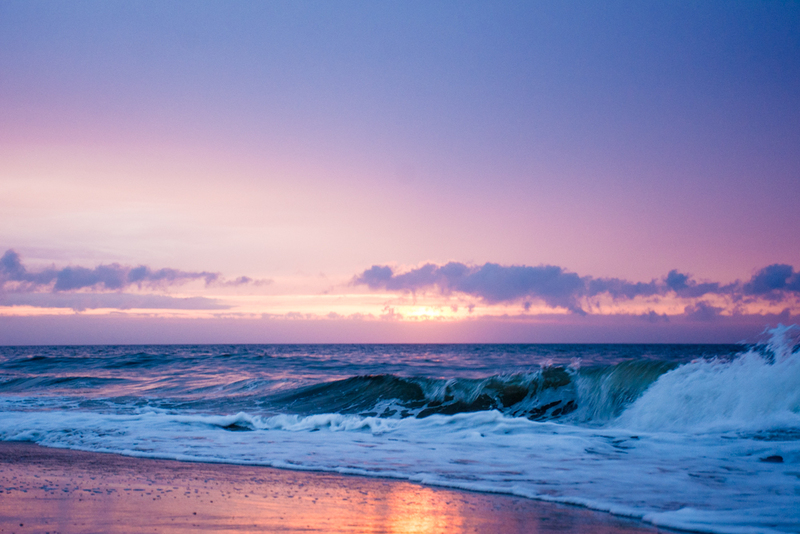 While all the tones of blues are lovely, when I think of the beach, I think of vibrant colors, sunrises, and sunsets. I put it on the back-burner for a while. Along with the simple submission of your work for an optional “welcome project”, everything submitted will be exhibited in one of MICA’s galleries, scanned, and posted on a blog promoting the exhibit. A conundrum for someone who may not even be there; a situation I don’t want to set myself up for. So a few weeks go by, I go on vacation, I write a few blog posts, and I struggle to work things out for school. You’ve seen it, and if you haven’t, scroll down 🙂 Among all of those things, I did my Sunrise/Sunset post, where I discovered a little hidden gem. As usual, when beginning a new weekly project, I show you guys a few pictures of things which I have already shot that fits the description. I really enjoy this little system which I have worked out; it allows me to revisit some old favorites, as well as work with some images that I really haven’t worked on at all. In looking for some sunrise/sunset pictures that I haven’t shared in the past, I stumbled across some of the black and white film work that I did during my first semester at school. I seriously haven’t been able to stop thinking of that one simple picture of the ocean ever since. I can’t wait until I have access to a darkroom again, because that’s the first photo that I’m working on. With that, I realized that cyanotype would absolutely work with beach photographs (how could I have ever doubted it?!). And once I got back from vacation with some new images, I had all I needed. Still, I waited to the last minute, well, almost. I haven’t quite figured things out yet, and still have a gap in regards to tuition being due for the semester. In my mind, however, I’m going. It’s decided. So with time ticking on this project, since it has to make it to the school by the 3rd, I decided to get working on things. First, and definitely the hardest part, was selecting the image. Like I’ve mentioned, the colors and details of the sunrises and sunsets are my favorites. So objectively, I looked at the images I had to pick one which I thought had some good variations in contrast, as well as some sharp details which would translate over well to a cyanotype, and this was the winning photo! Second, was converting the image to black and white and inverting it. I’m always tempted to print the “negative” version of the image when I’m working on it, and almost did so on accident today. I don’t know why, but in my mind when I see the black and white version of an image that I’m working on I automatically think that I’m finished. I’m pretty sure all of my cyanotype files have the black and white negative file to go alone with the positive file that I actually use. Luckily for me, and my wallet, because those photo transparency sheets are expensive, I’ve only made that mistake one time. Still, even if I do print one out, I’ll be sure to use it. The negatives make such ghastly, interesting images. You can see one of my “happy accidents” here. Once that’s done, it’s off to the print making. I’m always a little nervous when it gets to this part. I’ve just finished working on an image which I liked at first, and then liked again as a black and white photo. Then, in one easy step I’ve inverted the image, and I’m not sure about it all over again. Will the details come through? Will I have enough contrast? This doesn’t look right! I have to remind myself to trust the process, and the fact that I’ve done this several times, and ended up with good results. This time, however, I only have one shot. The pressure is on! Though I have been pretty lucky in my recent cyanotype/photo transparency combinations, I did have some pretty bad results while just starting out. I couldn’t help but worry when using a different type of paper, and only having one chance, that I would mess up. It doesn’t help that the instruction letter also stated in all caps “we are not able to send another postcard, so what happens if you make a mistake?”… Essentially? Fix it and deal with it. I didn’t like the sound of that. I’m very much a perfectionist when it comes to presenting someone with a final print. A sub-par or doctored up image just wasn’t going to cut it. Luckily for me, all my worries were put to rest. Aside from the added panic that some passing clouds caused, I’m really happy with the way this print turned out, and I think I may have just found my new favorite thing to do. Like it’s black and white counterpart, as well as my image from a few weeks ago, this style gives my beach photographs new life. I’ve been making postcards and greeting cards for my Etsy shop for some time now, but have stuck to contact printing with botanicals. They’ve been reasonably popular, but I think this will become a quick new favorite in the shop! I love the dreaminess of this print, how soft the waves and sand looks, while still being able to make out clear details in both the water and sky. So, appropriately, I’ve named it “Summer Dreaming”. As I set my little postcard project out to be picked up in the morning, because yes, the final part of the project was that they prefered for it to actually be mailed, I had to admire it a little more. It really charmed me, as well as the crunchiness of our old, chipping mailbox. But seriously, who wouldn’t love to find something like that in their mailbox? Too cute, in my opinion. Hopefully it makes it there in one piece, and without all the emulsion rubbed off. Wish it luck! I searched far and wide for things “out of place” this week, and as predicted, it was pretty difficult. I started my journey with a car ride, thinking, perhaps I would drive somewhere new, and maybe I’ll pass by something interesting. The car ride started off with a tractor in the middle of the road; not that unusual for this area, but for the major road I was on, it was very odd. I took this as a good sign of weird things to come, and kept driving! Two hours later and with only my poorly shot-while-driving picture of the tractor in the road (don’t worry, I was going really slow, was stuck behind the tractor, and being careful), I was without anything good. Slightly defeated, I went back home. I spent the rest of the week driving around, a little closer to home, and looking up things online for ideas. The driving proved useless, with the exception of the fact that I like to just get away and drive anyways, so that was nice. Online, when you search for “out of place” you get the interesting, yet very cliché photos of a group of items with one item having a variation; all yellow balls and one red one, a row of things standing up while one is on its side, and so on. While they were visually pleasing, I felt like that would be a cop-out, because how else could being “out of place” be anymore obvious than to make one thing drastically stand out? We lucked out in the weather department this week, and had a bunch of sunny days. Even more lucky was the fact that they were not all scorching summer days. I know, I’ve been looking forward to summer, but it’s been crazy hot. Don’t worry though, I’m not one of those people who wish for summer to come, and then complain about the heat. I’m just not one to subject myself to 100 degree+ weather without it being at a place that’s somehow related to water. Since there is no water in my life right now, other than the hose out back, which I’ll pass on, I haven’t been enjoying the outdoors as much lately. Regardless, I’ll take a summer day at any temperature as opposed to a winter one. In my consistent checking the weather to make extravagant day dreaming plans, I noticed that one day would be mild in comparison to the record-breaking heat we’ve been having, and I decided to venture out to a place I’ve only been to once before. Now, I’m kind of a homebody in the sense that I don’t particularly like doing things on my own (I mean, adventures are just so much more fun when you have friends around, ya know? ), so this was kind of a big deal to me. With all things considered, I was definitely the one that was out of place. I drove an hour and a half to the wrong place, had to search for new directions, find another place to go to, and then finally, I was there….or so I thought. Have I mentioned that I often find myself eating my own words? A mild hike…not exactly, particularly when you’re wearing flip-flops because you thought you were going to a place which required only a 10 minute walk on a paved path. So I drudge through the 1.8 mile hike, which was incorrectly marked might I add, and got attacked by bugs for what was more like 2.3 miles, you know, because of that whole lack of preparedness thing. And that beautiful day? Not so much when you’re hiking in jeans….I was a hot, sweaty mess. At least the scenery was pretty, which was a good distraction as I was cursing myself for going on with this hike when I knew it probably wasn’t the best idea. But alas, I made it to the beach. It was a little smaller than the one I had visited previously, and didn’t have some of the same factors which made the other beach a prime shark tooth finding area, but I was still happy to be there. The cliffs are so interesting; I’m always wondering how many years of sediment and fossils are built up in those towering edges, just waiting for one to fall down while I’m there so I can find some long-lost item. Of course, that didn’t happen the first time, or this time, but It’s still an interesting place. I searched around the area for some teeth, but to no avail…seems like everyone else was finding them though. Guess that’s just another excuse for me to return, and I’m going all out with my teeth finding equipment next time. I hung out for a while, searching for shells and teeth, snapping some pictures, and just enjoying this little isolated beach, and then headed back on another flip-flop clad “1.8” mile hike. It wasn’t that bad; the though of death and foot amputation only crossed my mind a few times. I only slightly considered throwing my flip-flops somewhere off the trail like Reese Witherspoon throwing her painful hiking boots in Wild. It was really pretty though, as I mentioned, so having that, as well as the huge beaver I had to run by, was good motivation to keep me going and snapping pics. I was, however, shocked with the feeling of euphoria that I had once I got to the car, not because it was over, but because I did it. It’s been a while since I’ve done something like hike around a new place, so even if I was tired and my feet were killing me, it was still wonderful. I’ll definitely be more prepared the next time, which will come sooner rather than later. It was also nice to get out there and into a place where I was actually in nature, not just the nice beach or scenic drive by type places I’ve been seeing so much of lately. With the theme of “out of place” in the forefront of my mind, walking this path really had me thinking about just how much we can be out of place in nature. Just looking at how the paths, though well-traveled, were being over taken by nature in some areas, and destroyed by it in others had me thinking of how much we want to mold this world into something we can control, when in reality these forces are so much stronger than us. Just a thought. I’ve always enjoyed viewing houses and places being reclaimed by nature. With how minimally invasive this trail was to the environment around it, It was nice to be out on a good, crunchy path, yet still see how nature can reclaim even the things we build to be most like it. While I only took one picture which I would consider suitable for this week’s theme, I’m going to share the rest of the photos I took along the way. My little “ladybug on vacation” is the winner for this week, since she’s not exactly your typical beach goer. I’ve always enjoyed finding odd things at the beach, and like to imaging that they’re just taking a break also. Enjoy! The ladybug may have been out of her normal habitat, but I think I know how she feels. can you see who is perched up there? I feel like finding something for this topic is going to be like the “Where’s Waldo?” of my 52 week challenge. I’ll be busy this week looking in all kinds of places for the odd thing out. It’s definitely ironic when I think about it; going through my day-to-day I find myself often spotting things that seem a little weird or out of place. When I go searching for them, however, that’s another story. I’m predicting a week of the most normal of things, people, and places, with no oddities in sight! I’m sure it’s just because I’m trying so hard to find the extraordinary in the ordinary that I can’t find things, so I’m going to work on just taking it easy this week. Hopefully I’ll be surprised, and my eye for the weird things in this world won’t let me down. On a side note, I haven’t forgotten about last week’s “sunrise/sunset” theme. My prop that I ordered should be here tomorrow, and I’m working out getting some model volunteers, so hopefully this will come together sooner rather than later. I’ve been thinking about this all week, checking the tracking every day, and looking out for the mail. You’d think I was waiting on a million bucks! It’s small and simple, but I’m still excited to get working on it! I was really hoping that I wouldn’t fall behind at all in these 52 weeks, but I suppose having only missed three projects, it isn’t that bad. I still have my ideas tucked away, so when everything falls into place, you all will see what I’ve been imagining. I can’t wait! So as I go in search of the evasive out of place items this week, I’ll leave you with my most favorite “odd” picture. On one of my abandoned house adventures last year, a friend and I stumbled across a house that looked like the scene of a bad break up. Everything was thrown outside and was in disarray. Things were all over the ground, just discarded to spend who knows how long out in the elements, and it showed. A lot of mess, but not a lot of great content, so I was a little disappointed. 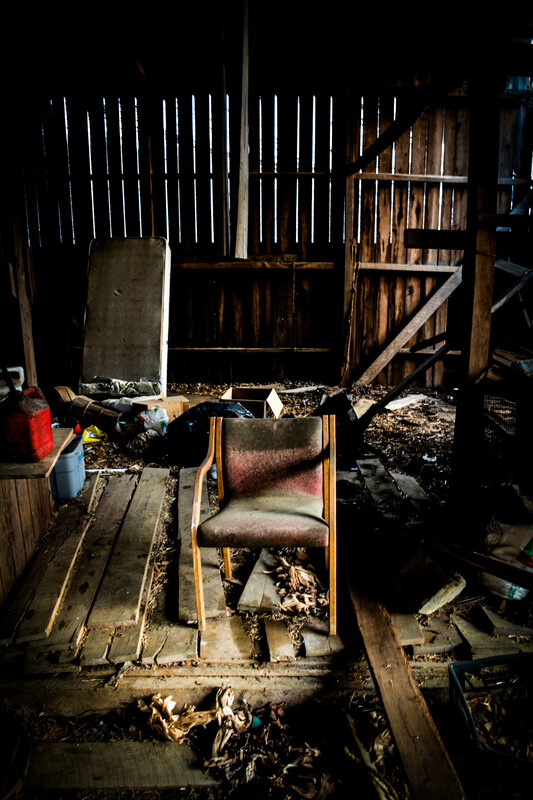 With a little further investigation, we noticed a few old barns on the same property, and ventured over to them. They were about in the same condition as the house in regards to objects being strewn carelessly about, but there was a lot more damage to the actual structures. For me, this is a good thing, because I don’t want to take pictures of some brand new perfect barn. So as the sun was setting and we were about to head back to the car, we stopped in the last, and largest, barn. I’m glad we did, because that’s where I got my little “out of place” surprise. This barn’s condition was what I suppose you could call better than the others. There was enough room to walk comfortably from one side of the structure to the other, and most of the mess was on one side. Don’t get me wrong, it was still a mess, and looked a little horror film-ish. Out of all the mess we had just experienced, I was shocked to see this chair, right in the middle of the room, standing upright and in decent condition, as if someone had just left it. Perhaps that’s where I get the slightly creepy feeling from; maybe someone was watching us the whole time. Regardless, I was captivated by how odd it was to have this chair standing in the middle of an entire property of mess. I’ve titled this piece “In Waiting”, and am happy to say that it snagged me the first place spot in my school’s student exhibition last fall for digital photography (yay!). Aside from being reminded of a mild horror film I saw many years ago, I had more of a longing feeling when looking at this chair. It was as if it was waiting for its owner’s return; the last object to stand up in a disaster of abandoned objects. Maybe someone will come back for you, but I feel you will be in waiting for much longer. Now if this isn’t a subject that is right up my alley, then I don’t know what is! Sunrises and sunsets; some of my favorite pictures are of these two things. Having just been to the beach for a weekend, I’m feeling a little remorse that I didn’t save a few pictures to show you for this post, but oh well. All the more reason to get out there and shoot some more! I would say that the trick to this week’s theme is to think of an idea that takes the very conventional landscape photographs and turns them in to something a little unconventional. I often find my self wondering just how many more of the same sunrise/sunset pictures I am going to take as I click away. Part of me hates the redundancy, you know that by now I’m sure. The other part of me just can’t get enough of it, and that’s the part of me that always wins. No matter how many pictures I have of the same beach, park or pier, I’m always pleased with the differences of each individual day, and am happy to capture a moment that I will never see again. And besides that, they’re beautiful, so why not get as many shots of that beauty while you can? It’s good to appreciate the sunny days while you have them. As far as the tricky part…Don’t you just love it when an idea immediately pops into your head, and it’s a good one? I do! And as rare as that is with my picky self, I’m quite grateful. Now, just to go out and find the prop that I have in mind (side note: yes! email just popped up with a coupon so I can order AND get a discount! ), and to recruit a couple of volunteers, the true tricky part, as usual. I suppose even if the volunteers don’t work out, my idea still will, but it’s just one of those things. I have the perfect vision of what I want in my mind, and I’m really hoping that I can capture it just as I see it. I suppose the other tricky part to this week’s theme will be getting that “sunrise, sunset” song out of my head….especially since I’ve had it stuck in there the whole time I’ve been writing this. Yes, I suppose you can tell I’m also feeling a little better since my last post. I know, I know, I kinda poured on the dramatics a little heavy with that one, but I was going through it, so give a girl a break. I’m trying to be a little more optimistic about things, which is hard, and contrary to how I usually am (I mean, I’ve gotta be realistic here). I’m also trying to keep myself motivated to work towards the things I want, like going to school, and finding a decent job. Taking pictures of my favorite things this week should be a great aid in keeping my spirits up. Fingers crossed that my prop doesn’t take too long to get here. I would do express shipping, but if you couldn’t tell over my coupon excitement earlier, I’m a free shipping kinda gal. On a final note, if you can believe it, I have some sunrise and sunset photos you haven’t seen yet. But Rachel, you post these kinds of pictures all the time! I know. Like I said, they really are my favorites. So here are a few unusual ones. First, a set of black and white photos of a sunrise on a vacation in Mexico with a few friends. This is actually the only time I’ve done sunrise photos in black in white, or with my film camera for that matter, because I’m always so focused on featuring the colorful sky. I love the somewhat aged feel these photos have; it doesn’t hurt that my negatives dried a little spotty, and that my camera just puts little spots on things anyways. It used to drive me crazy when working with film, but to some extent, I think I’m just going to go with the flow now. I mean, of course I’ll be scrubbing some of those negatives to get a clearer print on about 95% of my pics, but the dots and dust, I can deal with. As for the sunset, we’re traveling to Argentina. While flying from Iguazu back to Buenos Aires, just at the end of our trip, we passed right over downtown, as well as part of 9 de Julio, wich is the largest avenue in the world. The view that we have is one of the smaller areas, closer to the airport, so check out the link to see the true monstrosity. When you’re walking across this “avenue”, it feels like it’s the everlasting gobstopper of streets! It’s really huge! Anyways, I’m always a little hesitant to use my camera while on planes (you know, they always say how it can mess stuff up. It freaks me out a little! ), but as you can see, I got over it this time. Enjoy, and wish me a speedy delivery! It’s hard to believe that we’ve already made it this far through the year, and that I’m already past the half way point of this 52 week challenge. I still have a couple to do from past weeks which I haven’t forgotten about, but for now, I’m just happy to be catching up on the few weeks I’ve recently messed up on! Independence is the topic for this week. It’s an interesting topic, and can have different meanings to different people. With the 4th of July just this past weekend, I’m sure the idea of independence comes to mind with a much more patriotic meaning for a large amount of people. For me, however, independence has always brought a different feeling to mind. I’ve always liked being on my own, being able to be myself, and not having to answer to anyone. I moved out when I was just 18, and haven’t really looked back. Though over the years this has been limited, I’ve tried to express myself the best I could while still abiding to the confines of the corporate world, and trying to be what many perceive as “a responsible adult”. I know you all have heard me talk about how crazy things have been lately, and I suppose I should break it down to you, as it really all comes down to one thing; my independence has been cut off. Yes, it’s true, I suppose the pay check of my (terrible) job was one, if not it’s only, perk, because now I’m out of resources and options. I’ve moved back in with family, and don’t really see the option to pursue my educational and artistic dreams. I’ve been accepted to MICA, a school I’ve always dreamed of going to, and have received 90% of the tuition in scholarships, grants, and loans, but am being suffocated by the fact that I cannot come up with the other 10%. And the icing on the cake — I can’t find a job to save my life! Everyone looks at me like I have three heads when I tell them I left my tenured management position in banking to pursue an art degree, and am willing to take a considerable pay cut to work at their company. I know, stay positive. I know, everything will happen the way it’s supposed to. But it’s been pretty difficult to stay positive when I start thinking that the “way things are supposed to be” may end up being the exact opposite of how I’ve always wished they would be. Yes, I know I’m lucky, as many have told me, to have family that will help me while I’m in need, but at the same time, this help comes with a lot of hurt. I know my family loves me, I love them too, but we have an interesting relationship, much of which revolves around them not understanding me and wanting me to change. Ah, yes, the sounds of teenage angst coming back — “parents just don’t understand!”. It sounds silly, I know, but that’s always been our relationship (and you can throw my brother, aunt and grandmother in there, too), and it saddens me to see just how unwilling they are to see things from a different perspective. Over the years I’ve been through quite a bit, professionally and personally, but one thing that I’m glad I’ve learned is how to see things from another perspective, and to gain information about situations before making a judgement. They’re quite the opposite. How I should be, feel, think, and grow in this world is made up in their minds, and that is where we will always clash. My deviation from what they expect is what angers them, and my desires to do things which seem illogical to them, because it is the only way for me, is where they find me irresponsible and immature. Independence. It’s really an interesting word. In a world, like mine, where family so strongly influences what you do, it can be a difficult thing to achieve, particularly when you need their support for things they find foolish. They’re practically begging me to give up going to MICA, find a regular job, and just be happy doing art as a hobby. I’m out of ways to tell them that going back to that life would most likely kill me… Gasping for air to get out of the dark waters which were that life took so much energy, effort, and bravery that I didn’t think I had, I don’t know if I could do it again. When I was in my very first class, on the very first night, of my very first semester in returning to school, we were instructed by my photography teacher to fill out a little card with our information on it. Half information about who we were, and half one of those typical introduce yourself to the group type exercises. One of the questions was to select which animal best describes you, and why. Most people have something fierce, like a lion, or a hawk, showing their bravery, strength, and confidence. Questions like this always throw me for a loop, so I had to spend most of my time thinking of how to select an appropriate animal. I know, it’s a silly introduction, who cares? But I always put too much thought in to these things…maybe because I remember situations like this three years later. Anyways, after much deliberation, I came up with what I still think is the most accurate animal to describe me, and why. A bird. At that time, I was nearing the worst part of my professional career, and my head was filled with ideas of a great escape, and how grand life would be in just a few short years. So when I selected the bird as my “spirit animal” so to say, there was really only one reason that I could think of as to why it was so fitting for my personality. I could fly. I would have the ability to be free, and escape to a new place any time I wanted to. Independence. No more confinement, no more restriction. I was trapped in a world where I dreaded waking up in the morning, and I wanted nothing more than to escape. I didn’t know it then, but going to school and incorporating that artistic outlet in my life at that time would be what really saved me, and helped me keep what little sanity I had at the end of it all. Waking up nearly three years later and seeing how things have changed, I’m glad that I took the chances that I did, and have started down the path I have. I’m also terrified that it was all in vain and that it’s steadily coming to an end. I have people watching my every move and judging my every decision in ways that I haven’t experienced in over a decade, and to be honest, it’s a little terrifying. This past weekend, though it may have been Independence day, was more like anti-independence day to me. I had my move on Friday of last week, and had to say goodbye to my life of freedom. I suppose the only small glimmer in that was that it was the holiday weekend, and I got to have a mini escape to the beach. There truly is nothing better than being there, to me. I could go there penniless, and would still have an immeasurable amount of happiness, serenity, and relaxation. It really couldn’t have come at a better time. So while I was there, I stopped to take a few pictures of my favorite places, as well as made time to visit places that I’ve always wanted to shoot, but never made the time for. Of course, there were my birds, flying free in the ocean air. Admiring them over a landscape which seems endless it really something I find hard to describe. It’s cathartic — I could just stay out there forever, watching them, and whatever else may come by. Even though I may not be “free” anymore, being in an environment like that really sets my mind free. When it’s normally racing with thoughts of what I could have done differently, what people are going to think about me, what I should and should not be doing, there’s quiet. When I look out in to the vast openness of the ocean, it’s like anything is possible, and anything could be just around the horizon. It’s the only place where there is freedom from the confines of my mind, while watching nature, feeling the sand between my toes, and admiring my spirit animal, in its many different forms. Loud noises are what I’m working with, while still doing some catching up in my 52 week challenge. Luckily for me, some good planning and a timely loud holiday made this one an easy theme. Of course, with all of the festivities in full swing around me, I had to go with fireworks for the “loud noises”, because really, is there anything else much louder around this time of year? Or ever? It’s always fun being at the beach to celebrate this holiday. Up until the past few years, I actually had not been out to see the fireworks on the 4th for a long time. In being invited by my aunt to go to the beach with her and my cousins, I’ve been lucky enough to not only get a few days of free beach vacationing, but have also had some fun times hanging out and watching the shows. tiny firework in the background! So the regular, permitted, official firework show is loud enough to count for my “loud noises”, right? Yeah, that’s what I thought too. You know how there’s always that rebel or two in the neighborhood that sets off fireworks even though it’s illegal (here it is, as least)? Well, the crowds in OC are a whole other story. Sure, I was expecting some noise and a few stray fireworks, but that’s nothing compared to what I actually got. Usually when I got to the beach with my aunt, we stay in a little place just north of OC, Bethany Beach, which is a much more quiet town. Unfortunately, the little old place where we stayed got torn down last summer, so we’ve been going to new places, and as I mentioned, stayed with family this trip. So, much to my delight, my other aunt got a nice little ocean front place for the week; something I’ve rarely had before, and definitely never on the 4th of July. Shortly after the firework shows ended, regardless of the rainy weather outside, tons of people flocked to the beach. It was dark, and people were using flashlights to find their way around. At first, you had the regular culprits — people with glow sticks, sparklers, and maybe a few fireworks which just sat on the ground. Nothing surprising, nothing really loud. Then, and as I suspect after the alcohol kicked in, the partiers came out, and they brought the big guns. These people clearly stumbling around, and not experts, were setting off huge, and I mean huge, fireworks on the beach and near all of the buildings. There’s your loud noises. Not only could you hear it inside with all the doors and windows shut, but because of all the streets running perpendicular to the beach, if they were too close to an intersection, you could actually hear the echo of the fireworks bouncing between the buildings. Fun stuff. I didn’t mind it, since I’m up late most nights anyways, and enjoyed the free show. I’m sure others, however, were a little annoyed as the amateur show went on well past two in the morning. With each firework they set off there was a roar of cheers, regardless of how successful they were. Yes, there were some very unsuccessful blowing up in the sand with people running away detonations, but that didn’t discourage the rowdy crowd on the beach! I’m guessing that since they just kept going, no one was hurt, so I felt a little better about watching, and laughing as I eavesdropped on their laughing and craziness. Eventually, the cops strolled by, flicked their lights, and the crowd started running. That didn’t deter them for the entire weekend, but it worked for that night. I had plenty of time to snap some pictures, and kind of appreciated their lack of expertise. Firework pictures can get a little redundant and boring in my opinion. Though they’re pretty to look at, it can get tiring to see the same thing after a while. With the amateurs, and their lack of ability to get a lot of their fireworks off the ground, I got some interesting shots of the sand and ocean being illuminated by the lights. So enjoy their (hopefully) harmless mishaps, and some people’s’ sleepless 4th of July night!